The summer holidays are here, but if you’re a parent there’s no time to rest! Besides taking care of the kids we know you’ll be thinking about which school you’ll be sending them to, especially if you’re planning to move home. Fortunately, York has many schools to choose from at both primary and secondary levels. The city also has several special schools available for children with special needs. We’ve put together a list of primary, secondary and special schools, along with details on their catchment area. There’s quite a wide selection, so we’ve focused on the schools with both a large catchment area and closest to the centre of York. Whether you’ve lived in York for years or you’re researching houses for sale in York, we hope this will help you on your house-buying journey. This primary school on Escrick Street has been running for more than 100 years. It has about 300 pupils in full-time education, with some children also making use of the nursery places. Its most recent Ofsted inspection gave the school a ‘good’ rating, with ‘outstanding’ grades in personal development and early years provision. The school has pupils from many different social and cultural backgrounds, and regularly runs charity events for good causes. They also provide many different clubs for pupils, covering topics as diverse as chess, sewing and family yoga. You can learn more about Fishergate school at the official website. Serving families around Homestead Park and Bootham Crescent, Clifton Green is a thriving York primary school. It has a population of around 400 pupils, including a nursery for 3-4 year olds. The school embraces several values including raising aspirations, enriching childhood and celebrating diversity. Some students at the school have special educational needs and disabilities, which Clifton Green works to support. They also publish a magazine which gives parents an insight into life at the school. Learn more about Clifton Green at the official website. Sitting next to the River Ouse, this primary school aims to provide a broad, challenging curriculum to its students. As well as the usual classrooms and facilities it has plenty of outdoor space including an allotment, sandpits and spiritual garden. Students at St Barnabas take part in daily collective worship. They also visit the nearby St Barnabas Church, and attend regular services for events like the Harvest Festival, Christmas and Easter. You can learn more about St Barnabas Primary here. Situated off Nunthorpe Road, Scarcroft Primary School works to turn its students into confident communicators and responsible citizens. They have a pupil population of 370 pupils across 14 classes, and place a strong emphasis on the arts. However, students also take part in a range of physical activities like gymnastics, dance and athletics. They are part of the South Bank Multi Academy Trust alongside Scarcroft, Knavesmire and Woodthorpe Primary School. This allows pupils from these schools to take part in activities together. Learn all about Scarcroft Primary School at their official website. Located just off Sixth Avenue, Tang Hall Primary School blends traditional values with innovative educational practices. They offer a creative curriculum with many different extra-curricular activities such as football, cooking, fencing and sign language. They are also part of the Pathfinder Multi Academy Trust, a partnership of church and community schools founded in 2016. For further details, visit the Tang Hall school website. As the name suggests this school is located just off Park Grove, northeast of the city centre. It values individuality and provides an exciting learning environment for all its children thanks to its fully equipped classrooms, gymnasium and huge outdoor spaces. The school provides specialist coaches for PE alongside several extracurricular activities. Where possible, the school personalises each child’s experience to suit their own interests as well. You can learn all about Park Grove here. These are some of the secondary schools with the largest catchment areas. Located south of the city centre in Fulfordgate, Fulford is a popular secondary school for students aged 11-19. Most of its students come from York’s southeast, as well as the York suburbs of Fulford, Fishergate and Heslington. It has more than 1300 students in attendance, 300 of which are in Sixth Form. The Sixth Form is one of the best performing in the country, and offers both academic and vocational courses. At its last Ofsted inspection, Fulford was judged outstanding. It also boasts several extracurricular groups including bridge, choir, STEM and many different sports. For further details, visit the official website. This school is situated in the heart of York’s South Bank area on Nunthorpe Avenue. Its history dates back to the 1920s, when the 1850s mansion was bought by York City Council. Today, it’s a popular school with a ‘good’ Ofsted rating at its last inspection. Millthorpe offers apprenticeships at four levels from Intermediate to Degree level. as well as the English Baccalaureate. There are opportunities in sports, science and more esoteric interests as well, thanks to a rich extracurricular program. Learn more about Millthorpe School at the official website. 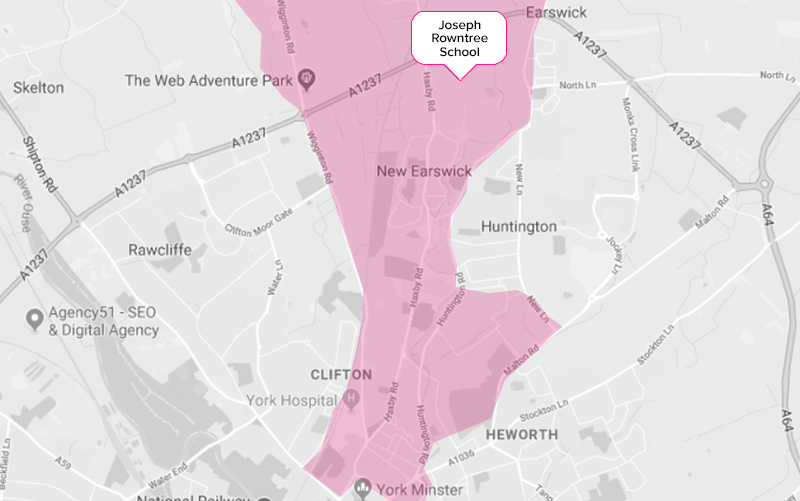 Named after the legendary York figure, Joseph Rowntree School has over 1,200 students in its classrooms. It’s located to the north of the city, and serves towns such as Haxby and New Earswick. The school boasts extensive grounds and playing fields, as well as state of the art facilities and strong pastoral care systems. It received very positive Ofsted judgements at its last inspection, and a very strong record of progression into higher education. For more details, visit the official website. This school covers students living in the Skelton, Rawcliffe and Clifton areas. A part of the Hope Learning Trust, the school boasts strong collaboration between parents and the school as a whole. Students at the school can take part in the Duke of Edinburgh Award Scheme. They are also involved in activities outside the school, such as the York Mystery Plays. For more details about Vale of York Academy, click here. Residents of Knapton, Acomb, Low Field and Chapel Fields can send their children to York High School, which is part of the South Bank Academy Trust. Their links with other institutions give York High School students opportunities in subjects like Drama, Latin and Art History. Students in Years 10 and 11 can also enjoy both GCSEs and vocational qualifications. Learn more about York High School here. Founded in 1546, this school is a Church of England Academy that serves Osbaldwick, Layerthorpe, Tang Hall and Foss Islands. It has received both National Teaching School and National Support School status, while students consistently perform highly in their A-levels. There are also more than 50 clubs running each week, while the Music Department has been recognised by the Royal College of Music. For more details, visit the official website. If your child has special educational needs, York has three schools that serve SEN children. This day special school is aimed at students aged 11-19 with moderate, severe and profound learning difficulties. They also provide education to children with additional needs on the autistic spectrum. Over 100 students attend Applefields and they come from York, North Yorkshire and East Riding. They can enjoy an after school club, and a Post 16 provision which offers vocational training and independent living. Read more about Applefields School at the official website. Danesgate is a city wide provision for York pupils with social, emotional, behavioural or mental health needs. It’s open to any child who is aged between 5 and 16 and lives in a York postcode. Where possible, Danesgate adapts its staff roles and community to meet the needs of its students. It works to give all its students achievement opportunities, and help them develop positive behaviours and constructive attitudes. You can learn more about Danesgate here. This is a federation between two schools–Hob Community Primary and Hob Moor Oaks. The former is a mainstream primary, the other a primary special school. Both schools take a holistic approach to their students, developing their self-esteem, social skills and emotional resilience. Hob Moor Oaks has various teams specialising in occupational therapy, physiotherapy and other areas assisting with students’ needs during the week. Hob Moor Oaks and Hob Moor Community Primary are now part of the Ebor Academy Trust, with a new website coming soon. However, you can access the current website here. If you’d prefer to send your child to a private school, York has several in the surrounding area. 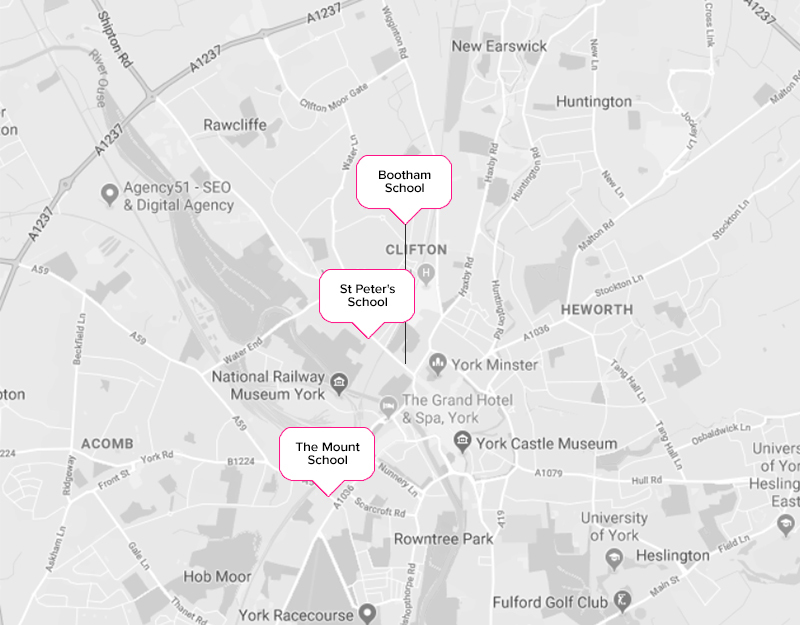 Based in the heart of York, The Mount is a day and boarding school for girls as old as 18 and boys as old as 12. One of nine Quaker schools in the country, they provide an exciting tailored curriculum and many different opportunities for all their students. Students who board at the school can enjoy a highly structured school day, with the assistance of teaching staff at prep time. They sleep in a Grade 2 listed building, with boarding staff on hand to provide round-the-clock care as needed. Learn more about The Mount School at the official website. This school was founded back in 627 AD, making it the fourth oldest school in the world. It has some of the best exam results of any school in the North, and is split into three different schools depending on your child’s age. Each school has an excellent reputation for academic achievement, with a wide range of activities including overseas trips for older students. Boarders at St Peter’s can also enjoy small, friendly houses and close proximity to York’s cultural centre. Learn more about St Peter’s School, St Olave’s School and Clifton School and Nursery at their official website. Founded in 1823, Bootham School strives to get the very best–intellectually, personally and spiritually–out of all its children. Students attend either the junior or the senior school depending on their age; at each stage they are encouraged to be adventurous, creative and contribute their own ideas. Boarders at Bootham can enjoy a warm, friendly environment. The school promotes an active relationship between staff, students and parents. Boarding allows children to learn more about different people and cultures, gaining a valuable global outlook in the process. Learn more about Bootham School here. With a wide variety of different schools, York is an excellent place to educate any child. If you’re looking at houses for sale in York, Quantum has everything you need to find the perfect home. We have many different houses for sale in York, and our friendly team of property professionals will support you at each stage of the buying process. We’ve also written several buying guides on topics like buying your first house and property hunting in York. Browse our list of properties for sale, or give us a call today on 01904 631631.